This information has been collected over time, for all versions of Outlook. Some of them only apply to Outlook when connected to Exchange server, some when not connected to an Exchange Server, and others that doesn't matter. They are in not particular order. Some information may be obvious, but if we have been asked anything short and quick about Outlook, then it has been placed on this page. Not all of these tips apply to all versions of Outlook. If you find that something doesn't work for you then it probably wasn't in your version. You can save multiple group calendars for quick and easy access to your team schedules and group meeting rooms. Make sure you're in the Calendar and click on the 'View Group Schedules' button on the toolbar, or click "Actions", "View Group Schedules". Add members from your contact list as if you were planning a meeting. Responding to a meeting request is now much more flexible. If you receive a request for a meeting that isn't at a convenient time, you can now propose a new time, rather than just declining the request. You can check each attendee's availability before proposing an alternative time. You can make important appointments stand out by changing their colour. Alternatively, you can colour code all appointments of the same type so that you can instantly see what you're doing on any day. You'll also see an option to edit the labels. This allows you to make up your own categories by customising the words that appear next to the colours. In the past, you've set the format for all new messages (plain text, rich text, HTML) in the Outlook options and that's changed it for all new e-mail messages. Outlook 2002 and above lets you choose the format of each message as you create it. Choose the required format from the box. It is possible to have Outlook minimise to your system tray (next to your clock) instead of sitting in the main task bar (next to the start menu). This requires a small change to your registry. So that you don't have to go delving in to the registry copy and paste the following text in to notepad and save it as mintotray.reg, changing the file type to All Types so that it is saved as a registry file. Then double click on it to install. Accept the prompt to add the change and then close and restart Outlook. When you minimise it, you should find an icon appears next to your clock. If you have created a large number of rules, you can export them. 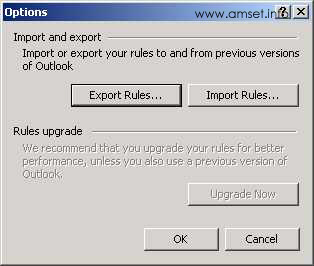 Click on options to Export your rules. When creating a new email, or forwarding a message, you can quickly enter the recipient. Instead of pressing To: and searching through your address book, you can simply type the first name, surname or username (the bit before the @ symbol). After moving to the next box or beginning the message, Outlook will attempt to look up the contact. If the entry changes to the full name, as per your address book, then it has found it. If it changes to have a red line under it, then there are more than one entries that match. Right click to select the correct one. If it does not change at all, then Outlook cannot find it. Check your spelling, or add a new entry. If you regularly send email to the same group of people, which is not already covered by an existing email list, you can create your own in Outlook. To do this, when in the normal Outlook view (i.e. not reading or writing a message) open your address book from the Tools Menu, and select new group. You will then be presented with a screen to give your group a name, and notes on what the group is. You can select the names to add to your group. They must all be in your address book already, or you can add them using the New Contact button. If you are presented with select names dialogue, the you selected Tools while in a message. Return to the main Outlook programme and try from there. When you are entering details of anew meeting, in any box that asks for a date, instead of using the calendar to work it out, you can type "next Thursday" and Outlook will work out the date for you. This can be useful if you are entering it quickly. If you are using a personal folders file and are constantly moving email messages around and deleting them it will get very large. This is because when you delete a message, the space in the file is left behind. What you need to do is compress the file. This is a quick and easy thing to do. Right click on your Personal Folders and select properties. On the resulting dialogue box, select Advanced. Your file will then be compressed removing all of the spaces. This also reduces the size of your file so that it uses less space on your hard disk and doesn't reach the 2gb limit so quickly. If you have created a PST file and then made a copy for archive on to a CD-R, you will find that you cannot access it directly from the CD. Copy the file to your hard disk. Open the file as normal. Registry Disclaimer: We cannot be held responsible for any damage done to your machine by using registry files or following any of the advice given on this site. Modification of your registry is done at your own risk. You should always have a back up of your registry before making any changes.